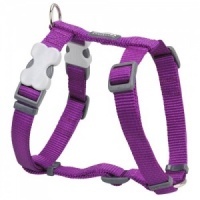 You may also want to add the matching lead and/or harness to your order. 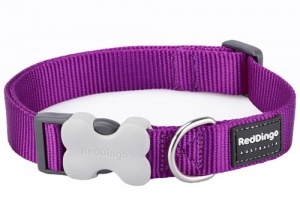 Purple dog collar by Red Dingo. Classic single eye-popping colours. Made with premium high density nylon webbing and solid stainless steel D-rings. They are adjustable, making them ideal for growing pups and all dogs. They are extremely hard wearing and feature the unique acetal plastic 'Bucklebone' which provides quick release and easy fitting and really adds that designer detail. 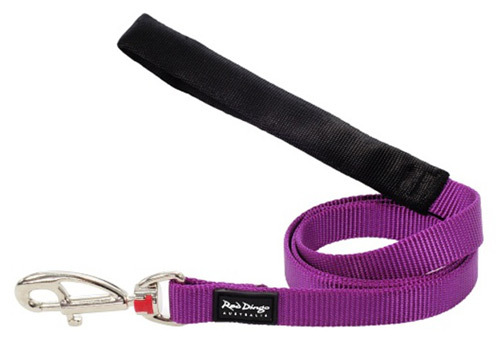 Matching lead and harness also available. I like this collar, it's well made and strong. The purple colour stands out against my dogs reddish brown coat and she likes that she doesn't have to wear it around the house and that it's easy to clip on when it's time to go out. Good quality item for a reasonable price. The item came quickly in the post.